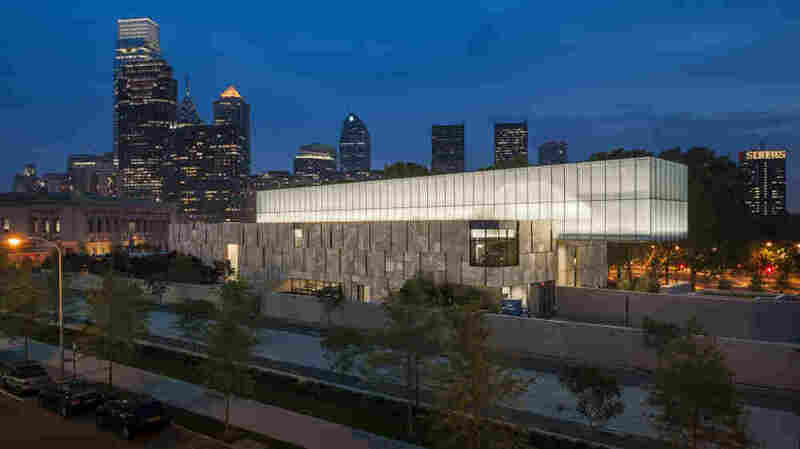 Barnes Foundation Changes Location, But Little Else After years of bitter controversy, the Barnes Foundation will open the doors of its new location in downtown Philadelphia on Saturday. Since 1922, the collection has been housed in the Philadelphia suburbs, where critics say the collection's owner would have wanted it to stay. 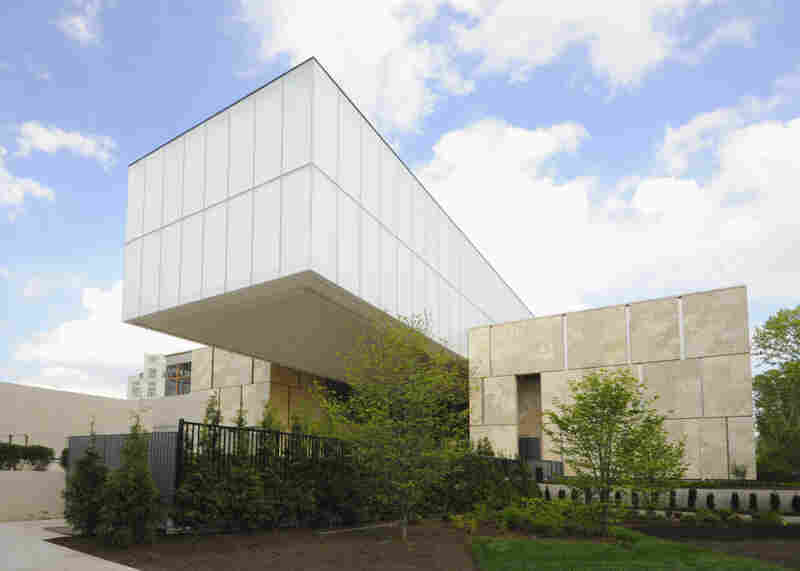 The Barnes Foundation opens the doors of its new gallery in downtown Philadelphia on Saturday. Its collection of paintings by Matisse, Picasso, Renoir, Cezanne and many more is now hanging in galleries designed to replicate those at the Barnes' old home in suburban Merion. The move follows a decade of bitter debate over the future of this multibillion-dollar collection. From the outside, you would never confuse the new Barnes with the old one. Where the original building was neo-classical and sober, the new Barnes is post-modern, all raw stone and glass. But inside, it's as if the old Barnes galleries have been copied and pasted into downtown Philadelphia. Albert Barnes built this gallery for his art collection in Merion, Pa., a Philadelphia suburb, in 1922. He wanted his institution to be a school for art appreciation, not an ordinary museum. "For people, they'll walk in and it will be the Merion that they think they remember," says architect Billie Tsien. Tsien and co-architect Tod Williams were careful to stick to the size of the original Barnes galleries. "The salient dimensions are all there, within an eighth of an inch or less," Williams says. "Those dimensions are all absolutely faithful." Williams and Tsien didn't really have a choice about that. Barnes Foundation officials promised a Pennsylvania judge they would preserve the dimensions of the original galleries; in return, he gave them permission to move the collection to a new $200 million building in Philadelphia. They also pledged to re-create the idiosyncratic "ensembles" of paintings, furniture and metalwork conceived and arranged by founder Albert Barnes in the first half of the 20th century. Even the burlap color of the walls looks the same. But that didn't stop the architects from making a few ... tweaks. Some of the changes are subtle: wood windows instead of metal, a lighter shade of oak for the moldings. The most dramatic difference is the lighting. 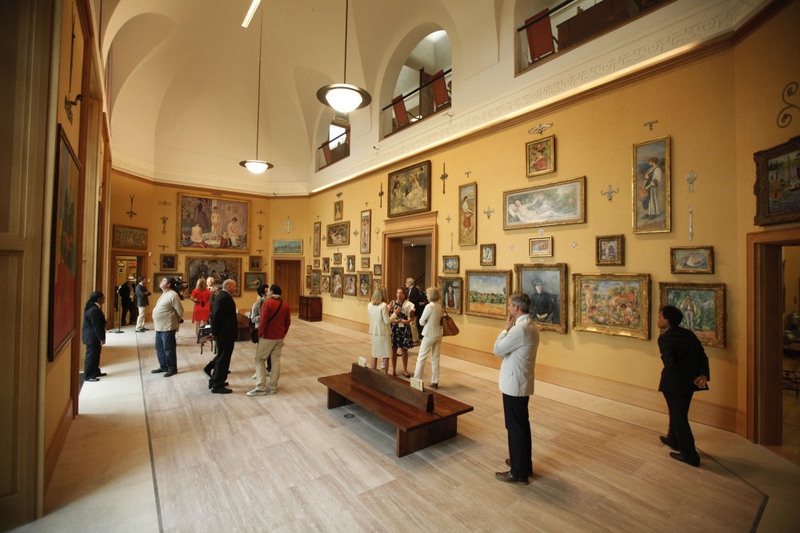 The lighting in the galleries of the new building (shown above) is a dramatic improvement over the lighting in the Merion building. 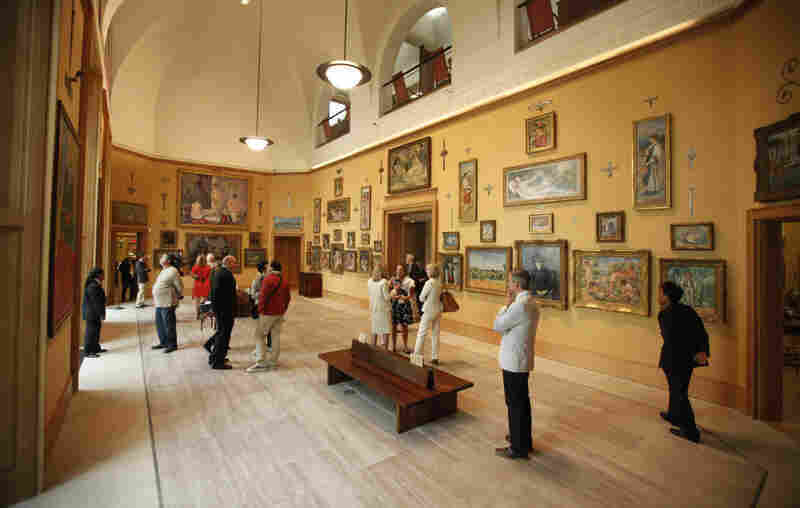 But that's the biggest change; Barnes Foundation officials promised a Pennsylvania judge they would preserve the dimensions of the original galleries in the collection's new home. Barnes director Derek Gillman shows off a second-floor gallery in the new building. "These Renoirs are alive in a way they simply weren't before, simply because of the blues and the greens really coming out," Gillman says. The architects were able to add natural sources of light in nearly every room. That brings out colors in the paintings you couldn't see before — and Gillman says that changes the relationship between paintings that have hung together for decades. "The Cezanne and the Picasso were so powerful that even in the poor light, they held the rooms. And now the Renoirs are coming back. And that's what Albert Barnes intended," Gillman says. Well, what Albert Barnes really intended, say the foundation's critics, was for these paintings to hang in the gallery he built for them in 1922. Barnes was very clear that his institution was to be a school for art appreciation, not an ordinary museum. He deliberately placed it six miles away from the Philadelphia Museum of Art, and the art establishment he despised. "The guy was an eccentric, he was a crank," says Philadelphia Daily News columnist Stu Bykofsky. "Even his friends thought he was a misanthrope. He's my kind of guy!" Barnes Foundation officials say the new facility — with classrooms, a lecture hall and modern library — will help them better carry out the foundation's core educational mission. Above, the view of the new building from 21st Street. Bykofsky says the irascible Dr. Barnes would hate the move, and the new building. To make his point, Bykofsky conducted a faux "interview" with Barnes, who's been dead for 60 years. "He was shocked, annoyed, dismayed, angered," Bykofsky says. "He was furious, because his will was broken. Technically it was not his will, but his trust indenture. 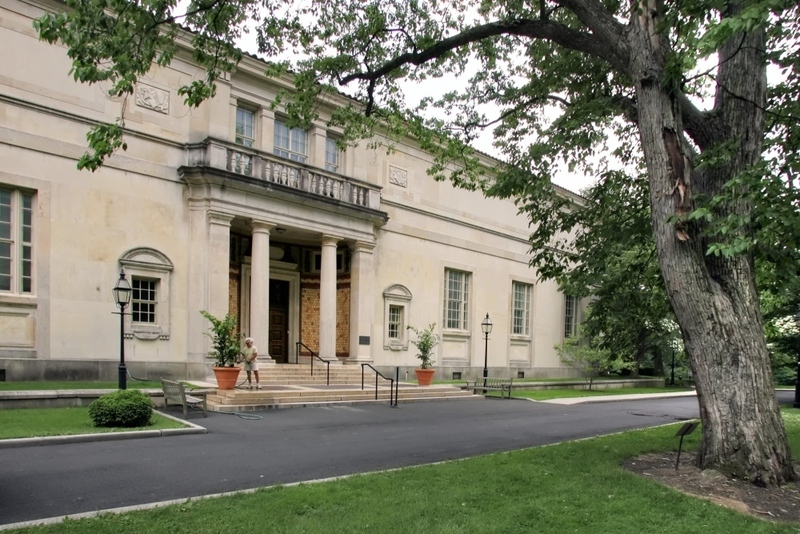 Foundation officials testified numerous times that the Barnes was going broke in Merion, and needed to move to a bigger gallery in order to survive. The machinations behind the move — which involved some of the biggest players in Pennsylvania politics and cultural life — were the subject of a 2009 documentary, The Art of the Steal. Barnes Foundation officials counter that the new facility — with classrooms, a lecture hall and modern library — will help them better carry out the foundation's core educational mission. Craftsmen recently put the finishing touches on a giant aluminum sculpture by Ellsworth Kelly that was commissioned for the garden outside the new Barnes. At the dedication in April, Kelly said the move to Philadelphia will be good for the art inside. "It means that millions of people can come see it," Kelly said. "And I think it's going to be a draw." Tourism officials in Philadelphia are certainly hoping Kelly is right. So are Barnes Foundation officials. But they're also pledging to try to duplicate the intimate experience in Merion by limiting the number of viewers in each gallery at one time. Architect Billie Tsien says that at one point, the designers considered a big sign to publicize the Barnes on the parkway — but then thought better of it. "They designed a huge sign that said Barnes Foundation," Tsien says. "But we said, wait a minute: This is not a place that is a conventional museum. This is a place where people come to look at paintings in a more quiet way." Skeptics have been wondering for a decade now whether that experience can survive the short trip from Merion to Philadelphia. For better or worse, they won't have to wait long to find out.